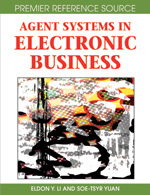 This chapter explores the utilisation of a multi-agent system in the field of supply chain management for electronic business. It investigates the coordination and cooperation processes, and proposes and discusses a newly developed model for an enhanced and effective cooperation process for e-business. The contribution made by this research provides a theoretical solution and model for agents that adopt the enhanced strategy for e-business. Both large organizations and SMEs will benefit by increasing and expanding their businesses globally, and by participating and sharing with business partners to achieve common goals. As a consequence, the organizations involved will each earn more profit.